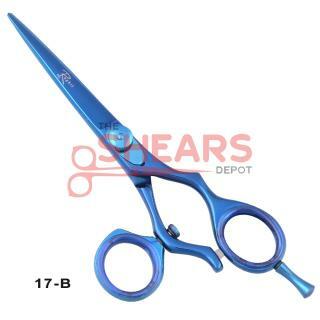 Description: Blue titanium finish Swivel hair scissor. Made of 440C Japan Steel. Free shipping! Free case! Free inserts! Free Shipping + Free scissor case + Free inserts with the purchase of your scisso! Description: An excellent quality Zebra swivel thumb haircutting shear. Made with high professional grade 440C Japanese steel for the professional stylists. Available at a great price! Description: Excellent looking 3 Ring double swivel hair shears. A great beginner on double swivels before you move on to the 2 Ring double swivel haircutting shear. 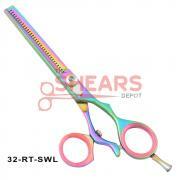 Description: High grade multicolor thinning shear made with Japan Steel. Free shipping! Free Leather case! Free finger inserts! Description: A unique design. For those who like to use a double swivel hair shear but are not used to handling it. This is the first step before you move on to the 2 Ring double swivel hair shear. Excellent price offer too!